"Panditji who made the difference to a Nation"
Born in Allahabad and blessed with the best of education by tutors at home, went on to study in fine campuses in England had only helped this young man turn into a leader of India's nationalist movement and eventually India's first prime minister after its independence. 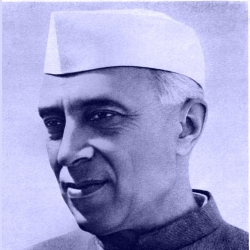 Jawaharlal Nehru a tall leader in Indian political history practiced law for several years. While travelling on a train, the incident of over hearing a British Brigadier gloating over the Jallianwala Bagh massacre by the British military, not only inspired but changed the course of his life. It was then Nehru vowed to take on the British. On joining the Indian National Congress, Nehru was deeply influenced by the party's leader Mahatma Gandhi. His interests were ignited to take significant strides and contribute towards the National movement. Nehru was named the president of National Congress in 1928 with the hope that he will attract the youth of the country and it was a year after, Nehru led the historic session at Lahore that proclaimed complete independence as India's political goal. Democracy, socialism, unity and secularism were the four pillars of domestic policies as Nehru envisioned and he largely succeeded in laying the foundation. While serving his country, he enjoyed iconic status and was widely admired internationally for his idealism and statesmanship. His lifelong passion and work on behalf of children and the youth led to the recognition of his birthday November 14 as the Children's day. As a prolific writer he authored a number of books and they include The Discovery of India, Glimpses of World History, Towards Freedom and the famous collection of his letters to his daughter Indira Gandhi. As the history witnessed these letters were powerful enough to bring out a great leader in Indira Gandhi to the nation. Such was a legacy that he left behind for us to be proud of. His historic speech ma 'Tryst with destiny' is considered in modern India to be a landmark oration about the Indian independence movement. In his own words "They call me the Prime Minister of India, but it would be more appropriate if I were called the first servant of India. In this age, it is not the titles and position that matter but service" will always echo the reason for us to celebrate Nehru.